Jorge Fernandez – Alvarez, M.D., Iker León, M.D., Gonzalo Vargas, M.D., Iker León, Alonso R. López, M.D. 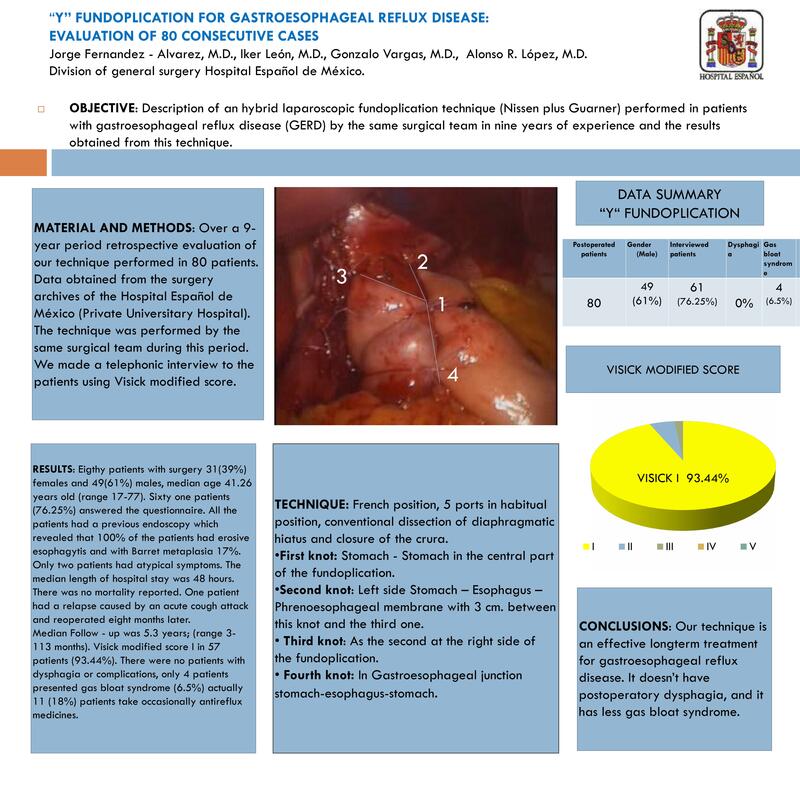 OBJECTIVE: Description of an hybrid laparoscopic fundoplication technique (Nissen plus Guarner) performed in patients with gastroesophageal reflux disease (GERD) in nine years of experience and the results obtained from this technique. MATERIAL AND METHODS: Over a 9-year period retrospective evaluation of our technique performed in 80 patients. Data obtained from the surgery archives of the Hospital Español de México (Private Universitary Hospital). The technique was performed by the same surgical team during this period. We made a telephonic interview to the patients using Visick modified score. TECHNIQUE: French position, 5 ports in a habitual position, conventional dissection of diaphragmatic hiatus, closure of the crura. First knot: Stomach – Stomach in the central part of the fundoplication. Second knot: Left side Stomach – Esophagus – Phrenoesophageal membrane with 3 cm. between this knot and the third one. Third knot: As the second at the right side. Fourth knot: In Gastroesophageal junction stomach-esophagus-stomach. RESULTS: Eigthy patients with surgery 31(39%) females and 49(61%) males, median age 41.26 years old (range 17-77). Sixty one patients (76.25%) answered the questionnaire. All the patients had a previous endoscopy which revealed that 100% of the patients had erosive esophagytis and with Barret metaplasia 17%. Only two patients had atypical symptoms. The median length of hospital stay was 48 hours. There was no mortality reported. One patient had a relapse caused by an acute cough attack and reoperated eight months later. Median Follow – up was 5.3 years; (range3-113 months). Visick modified score I in 57 patients (93.44%). There were no patients with dysphagia or complications, only 4 patients presented gas bloat syndrome (6.5%) actually 11 (18%) patients take occasionally antireflux medicines. CONCLUSIONS: Our technique is an effective longterm treatment for gastroesophageal reflux disease. It doesn’t have postoperatory dysphagia, and it has less gas bloat syndrome. Keywords: Antireflux surgery; Laparoscopy; “Y” Fundoplication; Gastroesophageal reflux disease; Dysphagia; Gas bloat syndrome.